Furthermore, the collective action problem effects the general business environment. Without a strong, coordinated voice on the importance of compliance, corruption continues to be seen as “business as usual” and the consensus continues to be that bribery is a necessary component of conducting business. 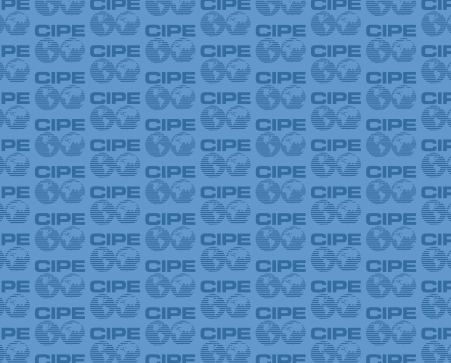 This collective action problem is pervasive and continues to pose issues for CIPE and its many global partners. It is difficult to implement reforms when SMEs fear that the reforms will hurt their business. Earlier this month, CIPE’s Washington office hosted a delegation of CIPE Russia officers and regional CIPE partners for a discussion on value-chain anti-corruption efforts in Russia. The discussion yielded plenty of interesting information on CIPE Russia’s plan to work with regional Russian chambers of commerce in order to educate local SMEs about international anti-corruption laws like the U.S. Foreign Corrupt Practices Act (FCPA) and UK Bribery Act. According to CIPE Russia office head Alexander Raevsky, by bringing more SMEs into compliance the program will allow more Russian companies to work with multinational firms, increasing profits and boosting the competitiveness of Russian companies. Before these initiatives can work, however, CIPE Russia has to effectively market the program to Russian SMEs. According to Raevsky, this is the greatest hurdle that CIPE Russia will face in implementing this program. Demonstrating the positive business benefits of anti-corruption measures is essential to these marketing efforts. Education is a cornerstone of any compliance program. While SMEs might perceive anti-corruption measures as inefficient and costly in the short term, anti-corruption efforts can boost a company’s long-term competitiveness and income. Compliant SMEs are more likely to attract investment and foster partnerships with multinational firms. The once seldom-enforced FCPA has become a powerful tool for the U.S. to prosecute multinationals that engage in bribery, with over 20 multinational companies fined in 2013. Last year, a Russian law took effect that goes beyond the requirements of the FCPA by requiring all Russian businesses to implement anti-corruption compliance programs. As a result of the new Russian law and continued vigorous FCPA enforcement, multinationals are likely to maintain a strong preference for doing business with Russian firms, including mid-sized enterprises, that have robust anti-bribery policies. While education is important, more intensive efforts are often needed to surmount the collective action problem. Convincing a handful of companies that compliance is beneficial for business growth will have little effect if the general consensus is still that corruption and bribery are necessary when conducting business. One of CIPE’s successful programs in Thailand has tackled this collective action problem head on. CIPE’s Collective Action Coalition Against Corruption, launched in 2010 with the Thai Institute of Directors, includes more than 300 Thai firms and multinationals, comprising nearly 25 percent of the Thai economy. While training sessions and roundtables organized by the coalition educate participating businesses on compliance procedures, the coalition has had an even broader impact on the Thai business climate. A survey of over 1,000 Thai companies demonstrated that Thai business people increasingly see corruption as a surmountable problem —an important shift in attitudes. Compliance programs must be built on these two planks: education on the business case for compliance, and building a broad consensus for reform. By creating a broad, effective coalition well-versed in anti-corruption techniques, CIPE and its partners have shown that the collective action problem can be overcome in countries like Thailand. Now the challenge is to adapt this successful model to the local context in other countries where SMEs are victims of endemic corruption. Henry Nelson is a Communications Intern at CIPE.